Kerry Nicolaides from FTRC looks at digital trends and the lessons we can apply to customer engagement. 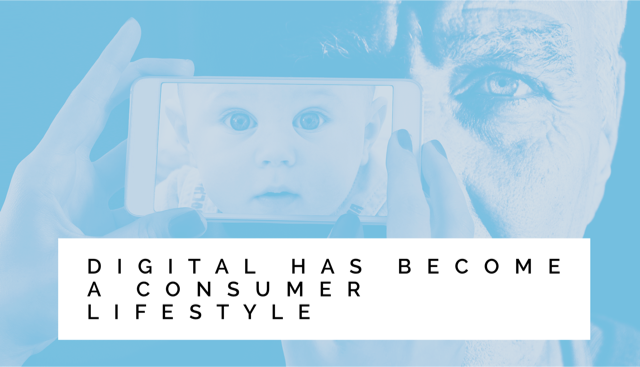 So many of our daily activities have gone from something that was once a physical time-consuming activity, to an instantaneous process which we engage with digitally, typically via our mobile phone. The level of engagement in an activity, whether it’s shopping for food, entertaining your children or travelling to work, is ultimately dependent on the level of funds available in your bank account. For this reason, financial decisions have a dramatic impact on our ability to do almost everything else in life. 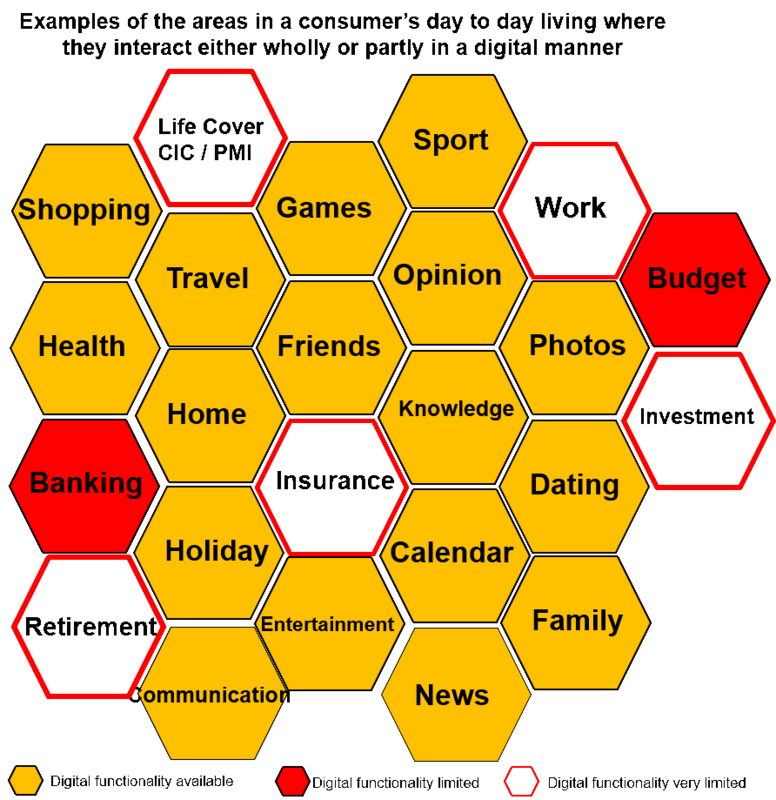 The diagram below illustrates some of the consumer’s daily activities which frequently involve the use of digital technology. This highlights the considerable lack of digital accessibility and information on a consumer’s personal financial life. In order for consumers to protect what they care about the most, such as family, health and hobbies, they need to make the right decisions about their personal finances. We frequently do not have the means to understand the information on which our personal financial decisions should be based, nor do we have support in making the right choice. How high up the pecking order do consumers consider their protection needs amongst their debt, savings and daily cost of living? Multiple studies identify one of the greatest causes of human stress, ill health and unhappiness is the lack of knowledge of how to manage income, expenditure and debt. The Office for Budget Responsibility identified that credit card debt in May 2016 was £2,397 per household. Based on an average interest rate and minimum payment this would take 25 years and six months to repay. It also suggested that consumer borrowing trends will result in most UK households spending more than they earn for the rest of the decade. Time and time again we have heard the consumer claim that they simply cannot afford the cost of protection. How often do we interact with our Protection needs? Protection is typically a long term investment. Instead of investing in something that you will get a physical return on, you are investing in a security you hope never to get a return from. The length of the term of the policy also means that there is very little consumer engagement other than on application and again when a claim is placed. It’s not surprising that when times get tough or the consumer struggles with meeting all of their financial commitments that protection is one of the first things to be cut. Buying a house is one of 3 biggest decisions you’ll make in your lifetime, alongside getting married and having a baby. It is also the most expensive. The majority of consumers will encounter protection products such as Life insurance or critical illness insurance when buying a property. Is this the time that the consumer wants to consider spending more money, and on a topic which is often tedious, complicated and uncomfortable to talk about? It’s highly likely that the consumer will either take the minimum and cheapest cover available or push back the conversation to a later date when they are not so financially overwhelmed. Offering the consumer a solution by providing them with the tools to make better day to day spending decisions and reduce their debt would in turn assist them in achieving higher savings which can then be redirected towards their protection needs. Protection would no longer be unaffordable or overwhelming. Moneybox (www.moneybox.com) is an example of a Micro savings tool which rounds up every transaction on your bank account to the nearest £1 and transfers the savings into an ISA. I personally signed up to moneybox six weeks ago and, without noticing any change to my disposable cash, saved £94. This £94 per month could go a long way to providing a mortgage protection policy. Our income, expenditure and debt define how we live our lives today, tomorrow and ultimately into the future. Tools which help the customer manage these key elements and redirect funds towards their protection needs will encourage engagement, develop trust and customer longevity towards the provider. Importantly, the customer and their family will be better protected.